Box Feed - Industrial Sewing Machine Technology, In order to provide beautiful seams and outstanding feed performance, JUKI adopted box feed system. The conventional feed mechanism follows an oval motion. On the other hand, the box feed moves the feed dog in a box motion. Auto Thread Trimming Function - One single action automatically trims both upper and bottom threads at the same time. It eliminates waste of your thread and time! Lock Stitching - Holding the reverse button will allow you to sew backwards and touching it will lock the end of your sewing. Start and Stop - You don't need your foot control to sew. Stop and go with the push of a button. 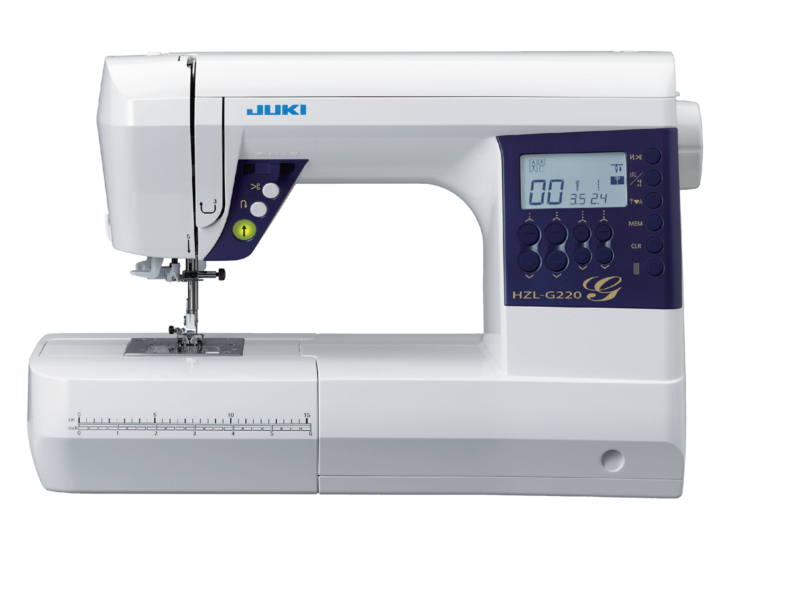 Wide Sewing Space - The Juki HZL-G220 has a wide underarm space, making it more enjoyable and comfortable to work with large projects. High Quality Buttonholes - HZL-G series sews beautiful buttonholes regardless of the type of material. 8 types of high quality buttonhole patterns are available for your needs. Automatic Needle Threader - The automatic needle threader easily threads the needle without eye strain and allows you to start sewing quickly, all with just the push of a lever. Quick Bobbin Preparation - Just follow the guide and it is not necessary to pull up the bobbin thread through the needle plate.